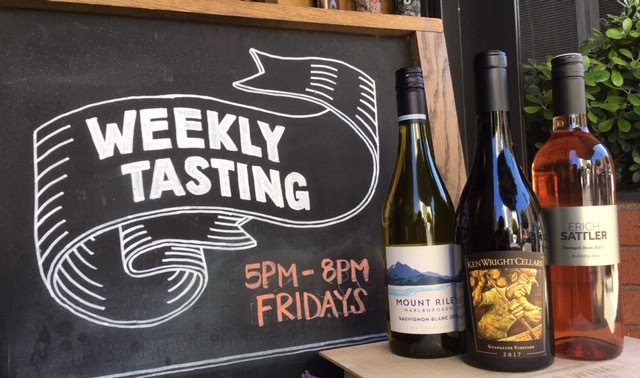 Join us today, March 29th, for our Friday wine tasting event from 5-8pm! Tonight we’ll be traveling the world by pouring some wines that are sure to make an impression. ’18, Mount Riley Sauvignon Blanc, Marlborough: This is a lean and highly mineral wine that bursts with fresh aromas reminiscent of citrus (limes, pomelo); small pleasant touches of fern or coriander and lemongrass are found as well. Enjoy this wine with seared scollops in a brown butter sauce and grilled fennel. ’17 Erich Sattler Zweigelt, Burgenland: Pine sap and dried ginger meet with fresh red-berry aromas and tart black plum on the nose of this wine. There are a lot of spices and herbs converging on the palate along with strawberries, thyme and crushed mint. Enjoy this wine with grilled pork chops and spicy mango chutney. ’17 Ken Wright Pinot Noir, Guadalupe Vineyard. Willamette: On the nose, this wine offers aromas of black fruit and blueberries seasoned with hints of clove and vanilla. It has a focused core structure on the palate with ample fruit and spice notes. Refreshing acidity brightens the fruit and gives the wine a pure fresh finish. Pair this wine with a mid-rare steak and a black pepper cream sauce.